I am going to start a new series of posts, in my garden #img so I can document what is happening outside of my kitchen each month. Please feel free to link up to this and each month I will include everyone who has done so. Without further ado: In My Garden November 2015. I absolutely love fresh tomatoes, picked straight off the vine. So do my dogs! I had to put the planter on bricks to ensure that they didn’t get to eat all of them. I planted the tomato vine with sage, flat leaf parsley and basil. Tomatoes are great for container planting and need to be planted in late spring or early summer. Try and use a terracotta pot for tomatoes to keep the roots cool. In order to help your tomatoes pollinate, shake the stems gently each day after you have harvested any ripe tomatoes. You can remove the suckers once a week to ensure a better harvest. Tomatoes need at least 6 hours of sunlight per day and the soil must be moist. Water at the base of the plant but be careful not to soak the roots. 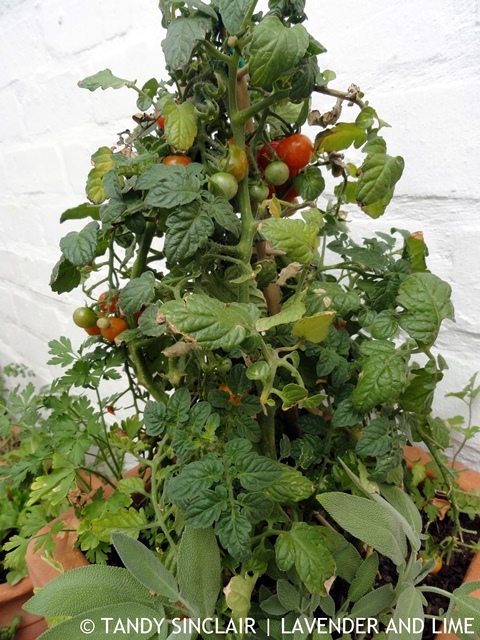 This tomato vine was bought from a local nursery that grows indigenous plants and encourages sustainable employment. 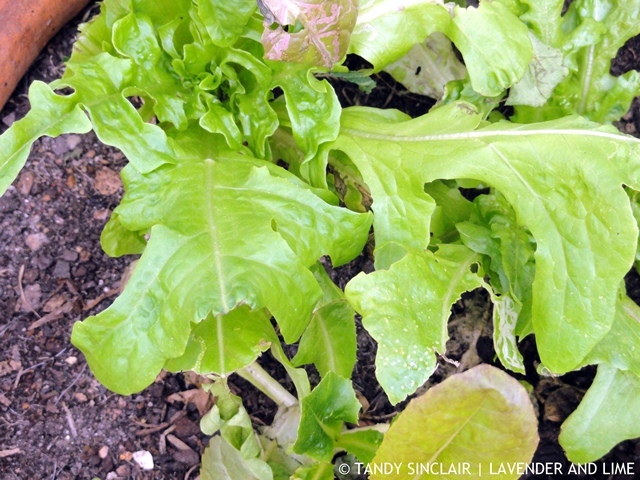 I bought lettuce leaves and even though they are still very young, I have already picked a few to go into our summer salads, with the tomatoes, and some rocket. My vegetable planter now has a fence around it so that the dogs can no longer walk through. I have planted carrots, fennel and rocket. I also stuck some marigold seeds that I took off my plants and stuck them in the soil, and they have started to show their leaves already. I see there is a sweet potato plant growing which means we did not harvest all of them! My tarragon continues to thrive, despite the fence being taken away that was offering some support. The chilli bush continues to flower and I am hoping for another bumper crop this year. Your dogs eat tomatoes? I have never heard of this! Too funny! As we go into winter, I must say that the garden is looking pretty good! What a wonderful collection of veggies you have! Must be such a treat to be able to put these all in a giant, fresh salad! Yum!!! I love that you are starting an “in my garden link up”. 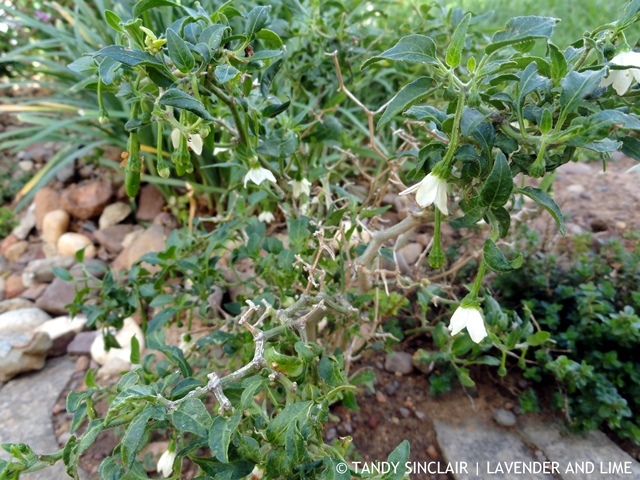 I love my garden but I think it might be a little too messy for a link up :0 I mostly have herbs and vegetables and they aren’t very “pretty”… tasty, but not pretty! Hi Tandy, my post for in my garden is up. I would love to be included in your monthly posts. Such a nice thing to keep a record of, always nice to know that you’re getting something out of the garden! P.S. sorry you’re having trouble with comments on my site, they are coming through I just have to moderate them for you for some reason! Hi Tandy, let me know when you will be doing your in my garden post, i would like to belong/follow. 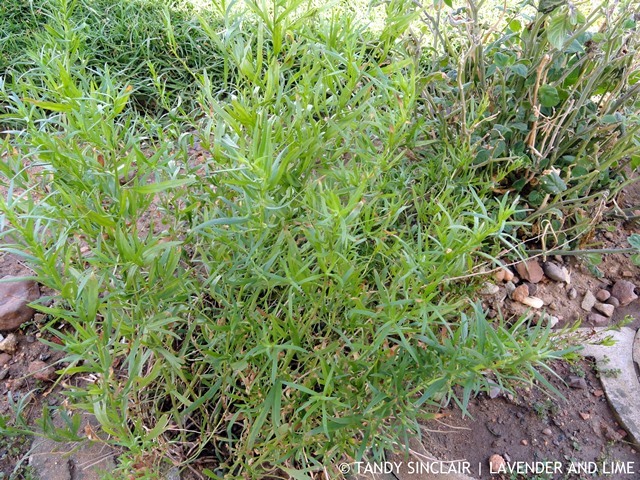 Your tarragon looks amazing, I have never had good luck at growing that one. I love your vegetable garden. I have a small garden with tomatoes and cilantro. I think it’s great being to just step into your own garden to pick out fresh herbs and vegetables. A lovely productive garden – Tandy – so looking forward to planting our new garden which as it is only small we plan to have 95% edibles. Enjoy the harvest. I am gonna enjoy this new series Tandy! Nice garden Tandy! There is nothing better than homegrown veggies. I love your new series on gardening (Ha, I wonder why) you’ll have to keep me in the loop in my off season. Tarragon is lovely, what an awesome bunch you have. Having a serious case of tarragon envy right now! I love it in chicken pot pie of all things. 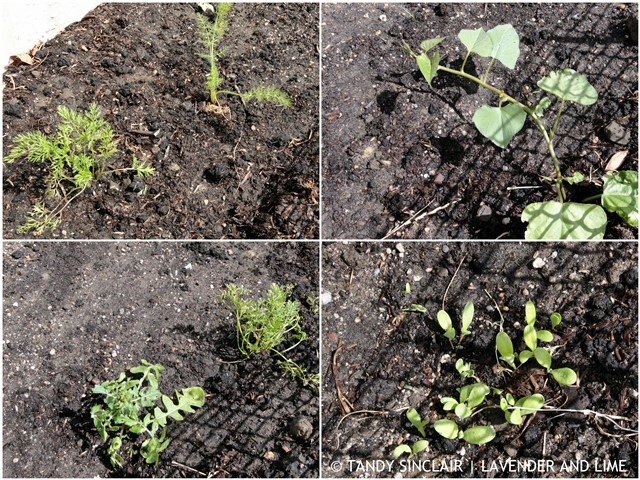 I love that you are growing your own herbs and veggies Tandy! We had a go at growing our own herbs last summer and found that some of them worked and some didnt – I think we needed a much bigger patch for them to all go into as some of them were ‘strangling’ each other. We are going to try again next year. Yours look like they are thriving! Love your new series, Tandy! As we are heading into winter and a very “un-green” season in Switzerland I will have the benefit of sharing your garden delights. I am thinking of installing high raise beds as Roco will eat anything green and dig holes.